Summer, sun, sunshine & skin protection! Thanks to its UV-absorbing properties, Karanja oil protects the skin on sunny days and makes it extra soft and supple. It provides the skin barrier with valuable lipids and provides plenty of moisture. The high content of antioxidants counteracts skin aging and harmful effects of UV rays. Together with raspberry seed oil, Karanja oil increases skin elasticity, promotes collagen production and ensures a tightened skin appearance. So mature and dry skin benefits especially from the facial oil. Even with bad skin and acne, it is highly recommended because of anti-inflammatory, regulating properties. Clean the face as usual. Then spray on a toner of your choice. Apply a few drops of facial oil on fingertips and massage into moist skin. Repeat the application as often as necessary to protect and nourish the skin. EU Sunscreen products must contain a mineral or chemical filter. Since it is a purely vegetable sunscreen, no SPF may be given on the product. 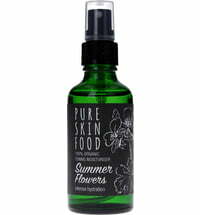 However, the protection factor of this facial oil is approximately equivalent to an SPF of 15. Pongamia Glabra Seed Oil *, Rubus Idaeus Seed Oil *, Sesamum Indicum Seed Oil *, Simmondsia Chinensis Seed Oil *, Rosmarinus Officinalis Leaf Extract *, Helianthus Annuus Seed Oil * (Sunflower oil), perfume * (essential oils), benzyl alcohol **, benzyl benzoate **, citral **, citronellol **, geraniol **, limonene **, linalool **.